If you’re a part of Internet Marketing, and you’re not ready with an opt-in email list as yet, then you should work on email list building. Without an email list of subscribers, growing your business success would get slow. Therefore, in this blog, we will talk about the importance of having an email list for your business and mainly the tools that are present, with which you can start your email list building. Why Should You have an Email List for Your Business? Internet audience is fast moving, and they tend to go from one to another in a fraction of a second. So every aspect of your user interface counts when you are trying to get their attention. Having a beautifully designed web page will not always lead to the fact that you’ll be having lots of visitors to your website who would come back again and again. Therefore, your potential customers might just miss everything new that will take place in your business. This is when email marketing campaign comes in handy. Just a click away, and you’ll be able to keep your subscribers updated about all the important news related to your business. This, in turn, makes your subscribers revisit your website frequently and keep coming back to you giving them a better brand recall. Experts like Joe Pulizzi, founder of Content Marketing Institute, believes that an email list is critical as one cannot build his/her own content on a rented land. He continues saying that the first step is to collect email addresses whereby a person can understand who are his/her readers and hopefully they will be his/her, customer, soon. If a person’s goal is to drive sales or keep customers happy in some way, then he/she would first have to get them as part of his/her audience. Web popup forms can be very effective when you are trying to build an email list. For instance, in EasySendy Drip plan, you can create popup forms that can be embedded anywhere on your website in a click. There are over 200 templates that are responsive, optimized, and are customizable. These web pop up forms are quite useful when you want to capture your anonymous visitors and convert them into potential leads. On EasySendy, the pop-up forms capture leads and automatically update your contact segments for further nurturing. Another amazing feature is the option to add social buttons. These social subscribe buttons speed-up the lead capturing process because your visitors don’t have to manually type in a form. At the same time, when they use social subscribe button, you get all their social information based on which you can create more targeted email nurturing drips. Web popup forms can be on-page scroll, exit intents, and recaptcha forms. These are great to capture visitors and add them to contact segments for further nurturing. Growing your email list is not all that difficult and will undoubtedly generate revenue for your company. With the help of these simple tricks, you can collect email addresses and enhance lead generation. Create a unique and engaging email content that will compel your subscribers to open it and click on it. It should not end here. Your email content should be amazing enough to make subscribers feel that it is worth sharing with their friends, family and colleagues as well. Go ahead and promote an online contest like free giveaways which will, in turn, have the entrants sign up using their email address. This will help you in email list building. Adding a link to your employee’s signature that will lead people to a landing page where they will be able to sign for your mailing list. Work on running a promotion on partner website or email newsletter that will target new but appropriate audience so that you can collect email addresses from a fresh source. Host a co-marketing offer with partners like e-books and webinars and tell them to promote the registration to their audience. Once it gets released, swap the leads. Host an online webinar and this will help you to collect email addresses at the registration. Host your own offline, in person events like conferences, meetups, educational panel, etc. whereby you’ll be inviting individuals and collect registrations online using an email address. Ever thought of using Facebook Messenger to build you email lists? Well, EasySendy has already figured out how and has it all set for you. With EasySendy Social, you can add Facebook Messenger Widget on your website so that you can engage with your visitors directly on Facebook Messenger. Why Facebook Messenger? Because everyone is on Facebook, and its a great way to nurture your visitors on Messenger. It is personalized and customized as well. You can nurture your Facebook subscribers at one-go in bulk. Also, you can automate various tasks like replies, private replies, comments, and likes. EasySendy helps you to capture email addresses, segment them based on behavior, and nurture them based on various events. If you want advanced lead scoring, lead tracking, and lead profiling, EasySendy Automate (powered by Aritic PinPoint- the mid-enterprise brand of EasySendy) is perfect for you. For those who are looking for individual tools, here’s a tried and tested list from our end. The mentioned list of tools to capture email address are no doubt some of the best ways to build your email list. However, it has been seen that website is the king of all the channels when it comes to capturing an email address. Given below are the list of tools that makes a website the best channel indeed for capturing email address for building email list campaign. This software is considered to be a lead generation plugin for WordPress. Thrive Leads is a list building solution to collect email addresses that were created by a group of people who were addicted to conversion optimization.This solution allows you to have your very own list building capability which further allows a favorable conversion rate. You will be able to experience an explosive list growth finally along with amazing business benefits. Thrive Leads have some cutting edge conversion tactics used by smart businesspeople and growth hackers. Optimonk was started in the year 2014 with the view to revolutionize the way e-commerce sites improve conversions. They have created over 3000 e-commerce sites, including some of those sites which are now market leaders. You’ll be able to recover 15% of your abandon visitors with on-site retargeting and track visitor’s behavior, detect existing visitors, display targeted offers and boost conversion. It has a gamut of features like A/B testing, real-time analytics and so on. Integrates with various websites and e-commerce platforms, Optimonk is a perfect tool or the business e-commerce platform to improve their conversion rate. Layered Popup plugin– which considered being the “king of popup plugins’ is something very new, attractive and captivating in the way it appears to the viewers. Other popup systems will at one point restrict you by existing templates where you’ll be only able to change the color, font, and text. However, the scenario is entirely different with layered popup plugins which allow you to flow your imagination thereby creating your dream popups for your website to capture the visitor’s attention. It has various types of popup plugins which you’ll be able to use as per your requirement. EasySendy Pro has recently got integrated with Layered Popup plugin, and customers have started using for quite a something from now. With the utilization of this popup, the number of customers has gone up as high as 60,000 which has, in turn, helped Pro to grow its business. Yet another highly popular WordPress popup plugin, Ninja Popup is widely used by marketers for building their email list of subscribers. It has been around in the market for quite some time, and they have a whooping collection of 22 themes and features. They are well designed, attractive and easy to integrate. Added to this they have a lot of styling options and are moderately priced. This is a wonderful list building plugin which is a powerhouse of features and tools for turning the past, present and potential customers into loyal ambassadors. Along with these benefits, it is quite affordable which in turn allows the small and the medium scale businesses to use the plugin for email list building. Experts consider this to be ‘must have conversion feature’ for every business website. Thousands of marketers are using ConvertPlug to increase their conversion rates faster and more efficiently. GetSitecontrol is a set of seven website widgets which are easily managed from a single dashboard. It is perfect widget for your site as it offers features like surveys, email opt-in form, contact forms, popups, follow, share buttons and live chats- all under one roof. Quick and easy to install, you will able to create beautiful contact forms, surveys, live chats, opt-in form popups and social media buttons in few minutes. It has subscriber widget which has customizable opt-in from that will help you get more email subscribers. Pop-ups and Slide-ins appear in separate boxes. They will either pop up or slide in somewhere on your website page which will allow you to collect the visitor’s email address. They are by far the best way by which you can collect email addresses and build your email list. Sleeknote is a great tool using which you can add pop-ups and slide-ins to your website. They have great visual popup builder which is ‘hands down,’ is the best around and makes it easy to create customized design that will suit your business type the most. List Builder is a free tool using which you can add popups to your web site. It is a part of broader SumoMe set of tools. This tool is incredibly easy to get started with and will allow you to do the necessary customization of the popup including text, font, and colors which can be used to collect email addresses. Yet another versatile tool for email list building through which you’ll be able to create very attractive pop-ups. Pippity is a WordPress plugin that will enable you to add pop-ups to your WordPress based website. It has a gamut of advanced features that will give you the privilege to change almost everything in your popup including text, fonts, color, layout, background images and more. It also includes many highly advanced options for controlling the behavior of the popup. Opt-in popup is a part of the Bloom plugin from Elegant Themes. It has been exclusively made for WordPress and enables you to add popups to your web site for email list building. The best part about this tool is that it comes pre-loaded with a range of templates from which you’ll be able to choose, and then you can customize colors, text, and fonts from there. Optinmonster is one of the most powerful email list building options when it comes to creating popups and slide-in for your website. This tool comes pre-loaded with lots of different themes which you’ll be able to customize or use their intuitive builder to design your pop up and slide in from scratch with Custom HTML and CSS. If you are looking for something that is super active but hassles free to use, then it is definitely targeting header bar. They are small bars that appear at the top of the page. As the user scrolls down the page, they remain at the top the page and ensures that it is always insight. It is used for adding scrolling header bar to your website. It works almost on any website without giving much importance to the content management system behind it. It is highly customizable as the admin interface allows you to change the text, colors, and placement of the bars. It even has advanced targeting option so that you can make the bar visible to certain visitors only. It is another tool used for adding scrolling headers to your website. It is a part of the Broader SumoMe set of tools. Free to use, Smart Bar works on any website regardless of the technology behind it. You can optimize the bar to use it on both the mobile device as well as desktop. 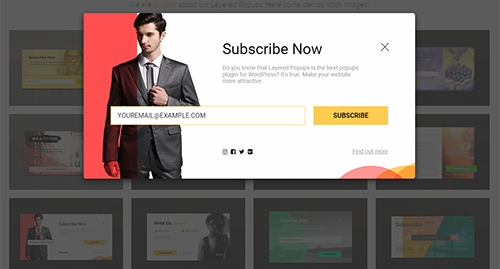 Opt-in widget is a tool that will make it easier for you to add beautifully designed subscribe box to the sidebar of your WordPress based website, facilitating your email list building efforts. Plug matter will allow you to add a Feature Box to your WordPress based website so that you can capture the email address of all those visitors as when they will visit your website. Highly customizable, this tool can be tweaked to match the design and branding of your website. Another tool in the Bloom suite, it enables you to add a pre-designed subscribe from wherever you will want it on your website. You are using WordPress and is already having various contact forms, then check out Leadin, which is an excellent WordPress plugin that can add some extra functionality to those forms. It tracks down the action of the visitors to your website and sends you feedback about the behavior of the person visiting your website once they complete a form. Your website is running on WordPress and yet you do not have a series of the form set up, then turn your attention to the Gravity Form. It is one of the most advanced plugins in the WordPress form builders in the market and integrates with Campaign Monitor so that new leads and contacts are automatically added to your chosen list. This is a tool which you use whereby you can redirect the commenters to a page of your choice when they make the first comment. Once they leave the comment, go ahead and ask them to subscribe to your email list to receive the update in future. In Upprev plugin, a slider will be created at the lower right or left corner of your blog as your reader will scroll down the blog while reading it. Welcome Gateapp is a cross between a popup and a squeeze page. A welcome will redirect the readers to the plugin when they visit your blog’s home page. This will allow the readers to choose to either enter their email address or skip it altogether without irritating them much. Interrupt is another tool from the team of AppSumo, enables you to place an email form at the top of your website. This is a free WordPress plugin. The readers won’t be able to see the email list once they start scrolling down the website. KickoffLabs has been positioned as the lead generation solution. It will offer both landing pages and a built-in email marketing solution so that you don’t have to purchase a service provider from outside. It also offers sign-up widgets and viral contest features which will in return grow your audience. Your website is the only great place where you can thoroughly focus on your email list building and the tools that have been mentioned above making it all the easier to design, build and implement beautiful email subscribe form that will get the results. The one thing any business, content, and conversion rate expert would agree with is the importance to collect email addresses and build an email list, which is vital for any business. Use the tips and tools above to build your online audience and engage with them effectively, creating a solid brand impression. Very helpful blog post! I have tried out few tools among them like layered pop and thrive leads, and it seems they are very effective to capture email list. I am looking forward to using other tools which you have mentioned in the blog post. Such a valuable information.Thanks for this great blog post.The email list is imperative to factor regarding email marketing, and marketers need to aware of the tools they can use for their business. I completely agree with everything you have said on this post. Many of email marketers fail to understand how important it is to have an opt-in email list. No business can grow without an email list of subscribers. The email list building list you have written seems to be effective. And you have managed to list all the noteworthy tools for building an email list of subscribers. Building lists can be tedious but not if you have the right tools at your disposal. Thanks for compiling these 25 tools that straightaway gives an insight into how they can contribute in building lists efficiently and smartly. Cheers! Yes, it is obvious that if you’re looking forward to increasing your business strength, then an array of subscribers in the form of the email list is a must. The onlookers are always on the net, just an attractive designed page is not enough. Email marketing campaign comes handy when we do not want our potential customers to miss out on anything new that will take place in our business. Email List Building tools you have mentioned is really very favourable. Those are some amazing tools for email list building. Thanks for sharing. Layered Popup for Word Press is indeed the king of popup plugins and it is my favorite too. I am using this integrated with EasySendy Pro and it is one of the best in market and yes it definitely helped me grow my business. Do try it out, I bet you won’t regret. Hey Ankit, great job here on Email List building, very ingenious. Indeed Email Marketing is significant to keep our potential customers updated about everything new that is taking place in our business and it also makes customer-brand relationship stronger. I am so glad that I came across this article, Ankit, thanks for sharing. Because optimizing our website to capture email addresses isn’t always easy and without the right tools it can be incredibly time consuming. I will check out these tools! Building an email list is one of the most effective ways to promote our content and also drive sales. This list of suggestions of tools that you have provided is really going to help me in the long run! Thanks for sharing. I am using Convert Plug and turns out it is absolutely a wonderful list building plugin. If you want to grow your business, then these list of amazing building tools is highly beneficial. The article is handy, as it was helpful in making us understand the 25 tools that straightaway gives an insight into how they can contribute to building lists efficiently and smartly. Cheers! The 25 tools discussed contribute a lot in building lists; hence thanks a lot for sharing an informative article. Loved to read this guidance. It’s insightful, and EasySendy is a great marketing platform. Thanks a lot for updating this guide on amazing list building tools. I am looking forward to make use of these tools in the future. Thanks alot for updating such a great blog, as it contains the most important tools which can be beneficial information for marketers.